The 3.6L V6 engine leverages a dynamic 280 horsepower and 258 lb-ft of torque (achieved with premium fuel) — offering an exciting ride for the driver and the driven. To help keep you in command of the road, steering wheelmounted paddle shifters and lowered sport suspension come standard. Did someone say sporty? The Passat GT exterior is pure performance car, starting with the front honeycomb grille in a high-gloss black with red accents. The black door trim, black roof, LED headlights and taillights, red brake calipers, and 19" Tornado alloy wheels complete the effect most impressively. 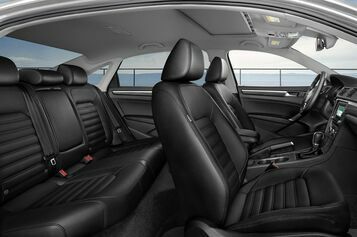 This is why the Passat comes with seven stability-enhancing features, a steel safety cage, and an Intelligent Crash Response System (ICRS). * Which can help prepare for the unpredictability of the road ahead. 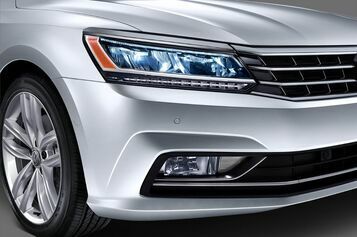 The Passat is designed to be family-friendly, thanks to the Rear View Camera System, available Blind Spot Monitor,11 and available VW Car-Net that lets you connect with your car. 1 Starting MSRP of $22,995 for a 2018 Volkswagen Passat S 2.0L TSI® with 6-speed automatic transmission. Prices exclude transportation, taxes, title, other options and dealer charges. Dealer sets actual price.